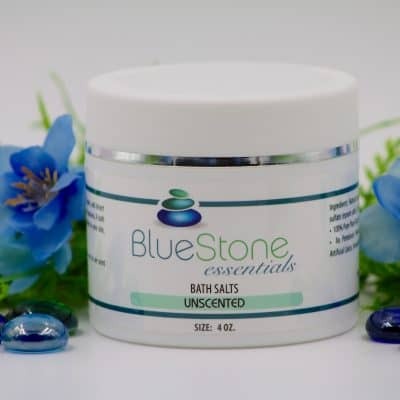 BlueStone Essential’s Tea Tree and Lemon Bath Salt combines the therapeutic properties of Dead Sea, Epsom, and desert mineral salts with pure therapeutic-grade essential oils to create a deeply penetrating aromatherapy bath salt which is as rich in minerals as it is luxurious. A bath enhanced with one of our bath salts will make ritual of routine, impart softness to your skin, refresh your body and leave your senses uplifted and at peace. Ingredients: Natural Sea Salt, Dead Sea Salt, Sodium Bicarbonate (Baking Soda), Magnesium Sulfate (Epsom Salts), Pure Therapeutic Grade Essential Oil Blend: Tea Tree (Melaleuca alternifolia), Eucalyptus (Eucalyptus globulus), Lavendin (Lavendula burnati), Lemon Tea Tree (Leptospermum petersonii), Kunzea (Kunzea ambigua);Sulfonated Castor Oil (Natural emulsifier) Certified Organic by Quality Assurance International.